The Philips Respironics ComfortGel Blue Nasal CPAP mask is the next generation of the original ComfortGel Nasal CPAP mask. The ComfortGel Blue offers the best characteristics of the original ComfortGel and adds several enhancements. An updated gel technology cushion and silicone comfort flap gives even more comfort and softness. Newly designed exhalation micro ports ensure a quieter operation and redirect air away from you and your bed partner. Respironics has also printed the System One Resistance Control code to the bottom of the cushion. If you connect this mask to a Philips Respironics System One CPAP machine, you can enter this Resistance Control Code and get the best possible exhalation relief and leak adjustments from your machine. 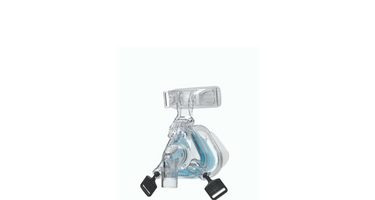 The ComfortGel Blue pulls technology from several of the more recent Respironics masks. Together, these technologies enhance the already successful ComfortGel design. Improvements can be found in the gel cushion and forehead pad design. A new angled elbow and exhalation micro ports reduce overall sound. As an added advantage, the ComfortGel frame has not changed and the new ComfortGel Blue Cushions and Original Gel Cushions are interchangeable. Similar sizes in either style will work with similar frame sizes of either mask.